After 27 years of marriage and raising three children, “angry artist” Annie Oh has left her husband and is about to remarry Viveca, the sophisticated Manhattanite who sells Annie’s paintings in her high-end art gallery. As if Orion, Annie’s psychologist ex-husband, isn’t hurt enough by Annie’s abandonment, Annie and Viveca plan to have their wedding in Three Rivers, CT, the town Orion and Annie had made their home for so many years. The couple’s wedding stirs up mixed reactions among Annie and Orion’s children, as well. Ariane is the do-gooder oldest daughter who runs a soup kitchen in San Francisco. Andrew, her once-rebellious twin, has found a deep (if judgmental) spirituality with his fiance in Texas. Free-spirited Marissa, the youngest, is trying to make it as an actress in New York. Each of them react differently to the news that their mother is not only remarrying, but is marrying a woman. As the family gathers for the wedding, each member brings his/her own secrets. Some secrets are new and can be worked out, but others have been festering at the core of the Oh family for years. In addition to the main storyline, there is a parallel story about an “outsider artist” who died in Three Rivers before Annie and Orion lived there. It adds an interesting historical element to the novel, and I loved the way the two stories are woven together, complementing and building on each other. It also adds to the artistic themes that run through the novel. I really loved this book. It’s been a while since I’ve read something this long and immersive, and I really enjoyed it. It was also my first Wally Lamb! I can’t compare it to his other novels, but I thought We Are Water was excellent. It’s told in a stream-of-conscious style, and it’s very internal. This book is basically the inner monologues of the characters as they go about their days and think about their lives and relationships. I haven’t read many books like this, but I loved really delving really deep into the heads of these characters. They’re all totally flawed, but Lamb does a great job of portraying even the most messed-up characters with compassion. I was impressed by how real and complex his characters seemed. We Are Water is a book about the secrets at the depths of families and how it’s impossible to truly know everything about someone. But it’s also about forgiveness and what it means to be a family. As secrets are revealed and new information changes how these characters see each other, they must learn to forgive and understand their family members in a new way. It’s a beautiful novel that dives deep into the events that can shake a person to his or her core and forever alter the way he/she relates to the world. This book goes to a really dark place that I wasn’t expecting, but I liked how it ended. 2013 is nearly over, and I can confidently say We Are Water is one of the best books I’ve read this year. I really loved this novel, and I would recommend it to anyone who enjoys complex novels that examine family dynamics and delve deep into the psyches of its characters. I received a complimentary copy of this book from the publisher via TLC Book Tours in exchange for my honest review. The publishers of this book have kindly offered a copy of We Are Water to give away. Click here to enter via Rafflecopter. Please note that this giveaway is only open to US residents. This giveaway will be open until 12 a.m. Nov. 13. Also, check back on Saturday (Nov. 9) to find out what I’m giving away for the Literary Blog Hop! Oh sounds great and I’d love to participate, shame I’m in Europe! Sorry Elena 😦 I wish I could open it up internationally. BUT I’m hosting a giveaway for the Literary Blog Hop (which starts tomorrow), and it is open to everyone! So great to hear good things about this one. 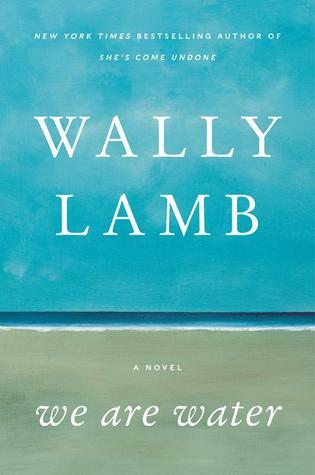 I haven’t read a Wally Lamb book since I picked up She’s Come Undone when I was wayyyy too young to be reading it, so I’d really like to give him another try. Thanks for offering the giveaway! Hah! I love stories about the books we read at a much younger age than we should have 😛 Good luck! I have really enjoyed all of Wally Lamb’s books. Can’t wait to get to this one. I read I Know This Much is True years ago, and finally got ahold of a copy of She’s Come Undone at the library sale last weekend. I’m so glad you liked We Are Water, because I’m very excited about it! I’ve heard such good things about She’s Come Undone; sounds like a great library sale snag! I’m reading my library copy right now and I would love to have this book sitting on my shelves with its Wally Lamb brothers and sisters. Thanks for the giveaway! I know that feeling; I’m guilty of picking up used/bargain copies of library books I’ve already read just so I can see them on my shelves. Good luck! Glad to hear you enjoyed it so much! I have read a few of his books- some I loved, others were ok. I really want to read more of his books now; which do you think are the best? I really enjoyed I Know This Much is True and The Hour I First Believed (liked this best), but really did not like She’s Come Undone. I definitely want to read more of his books now! Nice! I have a signed copy, but I don’t touch my signed copies!! A reading copy would be great! I would love a copy of this one. I’m intrigued by all the differing opinions I’ve been hearing. Huge fan would love to read this book. I think I’m the only person I know that couldn’t get into a Wally Lamb book! But, this one looks pretty good so maybe I’ll give it another go. I’ve never read Wally Lamb before, so I can’t compare We Are Water to his other books, but I hope you like this one better! I’ve read SHE’S COME UNDONE and I KNOW THIS MUCH IS TRUE and really enjoyed both. I’ve been looking forward to WE ARE WATER for a while now and am grateful for the chance to win a copy. Thank you for sharing your insights and for offering this giveaway! I’ve only read She’s Come Undone, but I read that in one sitting. Sooooo good. Thanks for hosting this giveaway. Great review! Wonderfully written review, Leah! I too loved this book and would put it in my best books of 2013. If you ever have the time try She’s Come Undone- his first novel. Powerful. Huge Wally Lamb fan would love to read this book. I’m so glad you looooved this one! I think Wally is fabulous. I also think this is a good tale about family and the secrets they keep, sometimes from themselves. I haven’t read anything by Wally Lamb yet – looks like this one would be a great place to start! I love Wally Lamb. Read all his others except the Christmas one. Just entered the giveaway for this! What a convincing review!! “After She’s come Undone” i was worried this wouldn’t live up to my expectations!! But I will give it a shot now. I love books that this (all the family drama). And what is it about weddings that brings it all out? I can’t wait to read this one! Oh, oh, oh… I’ve been licking my chops since this book was announced. Have read all of Wally Lamb’s books and am ready to sink my teeth into this one as well. The longer the better! 😉 Fabulous review and I can’t wait to read. So happy to have found you via the Blog Hop. This is definitely my cup of tea!!! I’ve only read one Wally Lamb book, and that was quite some time ago. This sounds quite good. Thanks for the chance to win. I’m so excited to find this giveaway! I have read a number of great reviews for Wally Lamb’s newest book! I’ve not read his work, so I’d be THRILLED to win a copy! Thanks for the giveaway! I’ve read some mixed reviews, but most really enjoyed. I’ve not read Wally Lamb, but I would love a chance! Sounds shocking! I mean, I have no problem with homosexual couples, but if your mother marries a woman after years married to a man, it would really shock you! I didn’t know the book, but it sounds great. It’s a shame I can’t enter the giveaway, so good luck to every body! Sounds like an interesting read. I haven’t read anything by Wally Lamb, but would love to win and try this book. This book sounds great, thanks for the chance to win it. I haven’t read any of his novels. I’m looking forward to this book, especially after reading your review. I read Wally Lamb’s first 2 books and they were fantastic. It’s been a long time since I read anything by him. Thanks for the insightful review. My wife is a Wally Lamb fan although I’ve not read any of his books yet. Now’s my chance. Thanks for the giveaway.